Find artworks, auction results, sale prices and pictures of Guan Zuolin Spoilum at auctions worldwide. 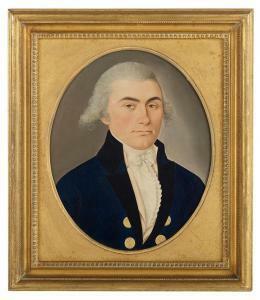 SPOILUM (FL 1785-1805) PORTRAIT CAPTAIN GEORGE DELANOE, RN head and shoulders, in blue coat with gilt buttons, inscribed and dated verso Geo. 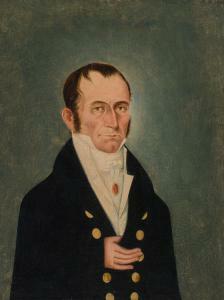 Augustus Delanoe Capt. Royal Navy 1794, with inscription recto Captain Geo. Delanoe RN 1794 and further inscribed above opposite shoulder in another hand 'Lost his leg by a 32lb shot at the Mutiny of the Nore on June 10 1797 when in command of his Majesty's Ship Repulse 64 guns', oil on prepared cloth, oval, 41.5 x 33.5cm Provenance: By descent in the family of the sitter's mother to George Harnage of Cambridge. Sold with his faded and largely illegible handwritten 1p history of the events and a transcription. The present beautifully preserved portrait by the Chinese artist always known in the West as 'Spoilum' has all the hallmarks associated with his remarkable portraiture, mannerisms and technique. It is directly comparable to other bust length portraits of British and American merchants, captains and members of the HEIC. The support is the same "cheesecloth-like canvas mounted on laminated wood stretchers" (Crossman, plt 10, right) and the original gilt frame matches that of Spoilum's portraits of two unidentified men (Crossman, plt 5 and plt 10, left). 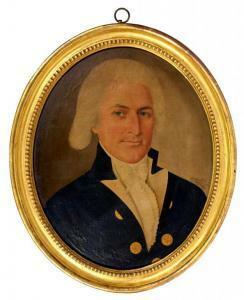 Captain George Augustus Delanoe, RN (1762-1802) was the son of John Delanoe of Guernsey and Dorothy Harnage (1726-1807, married 1758), 1st Lieutenant and Commander of HMS "Repulse" a third rate ship of the line of sixty four guns. During the Mutiny at the Nore on June 10th 1797, Delanoe lost a leg by a shot fired from another vessel whilst escaping from the mutineers. He was awarded a pension and later promoted to Captain although he did not live long enough to assume the rank. Delanoe was buried at Lynsted, Kent. He was unmarried. (References are to C L Crossman, The Decorative Arts of the China Trade, Woodbridge 1991, Chapter 1). ++In very good entirely original condition. Slight instability of medium lifting and cracked in places most noticeable when held at an oblique angle to the light, varnish discoloured with age. Spoilum (Guan Zuolin) (Chinese/Guangzhou, active 1770-1810) "Portrait of a Captain of the British East Indies Company" oil on canvas unsigned, a "Vose Galleries/Boston, Massachusetts" label en verso. Framed. 17-1/2" x 14", framed 23-1/2" x 20-1/4" Provenance: Estate of Dr. Carroll Ball, Jackson, Mississippi. Notes: The Cantonese artist Guan Zuolin, colloquially known as Spoilum, was one of the first Chinese artists to work in oil on canvas as opposed to the more usual inks and colors on paper or silk. A resident of the busy port city of Guangzhou, the only Chinese city to allow trade between Chinese and Westerners, Spoilum taught himself Western art techniques by copying British paintings and prints. He specialized in portraits of British and American naval officers and prosperous local merchants, though he was also known to produce the souvenir landscapes popular with the Western visitors to the city. His portraits, as evidenced by the one of an unidentified officer presented here, are almost always in ¾ length, against a vague background, the sitter gazing directly at the viewer, rendered in a minimal palette of black and flesh-tones with little interplay of light and shadow - all of which serve to emphasize the features of the sitter. Works by Spoilum are conserved in numerous maritime museums including the Peabody Essex Museum, Salem, Massachusetts. Height 26 1/4 in. by Width 21 3/4 in. 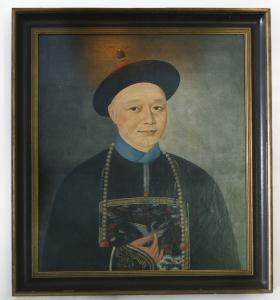 Christie's, New York, Chinese Export Art, January 25, 2011, sale 2404, lot 151. The merchant here wears the blue-finialed Mandarin hat and goose badge of a fourth rank civil official, and delicately fingers his beaded necklace. FOLLOWER OF SPOILUM (fl c. 1785- 1810) Portrait of a Gentleman, seated half-length, in a library, holding a letter in his left hand oil on canvas 28 x 25in (71.2 x 63.5cm); in a period rosewood veneered frame. 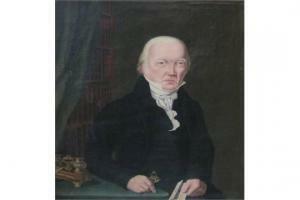 The precise attribution for this portrait remains unresolved, though there are a number of stylistic traits reminiscent of the work of Spoilum and members of his immediate circle.